Football star Lionel Messi, 30, and his partner Antonella Roccuzzo, 29, who have two children together, got married in their hometown Rosario before 260 guests. 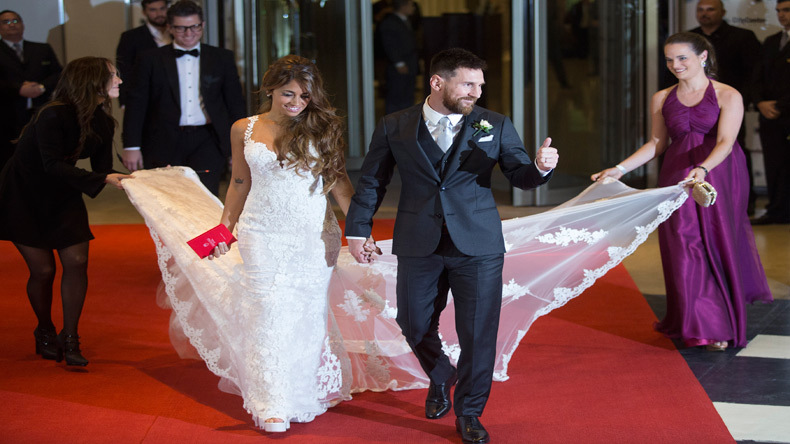 Argentine soccer player Lionel Messi(R) and his wife Antonela Roccuzzo make an appearance for the press at their wedding in Rosario, Argentina. Argentine soccer player Lionel Messi(L) and his wife Antonela Roccuzzo pose at their wedding in Rosario, Argentina. Barcelona FC's Luis Suarez(L), teammate of Argentine soccer player Lionel Messi, poses with his wife Sofia Balbi as they pose for photographers as they arrive at the wedding of Messi. Argentine soccer player Lionel Messi(L) kisses his wife Antonela Roccuzzo pose at their wedding in Rosario, Argentina. Argentine soccer player Lionel Messi's parents Jorge(C) and Celia(L) and his sister Maria Sol pose at their wedding in Rosario.